Disclosure: Thank you Aussie for sponsoring this post. All thoughts are my own! 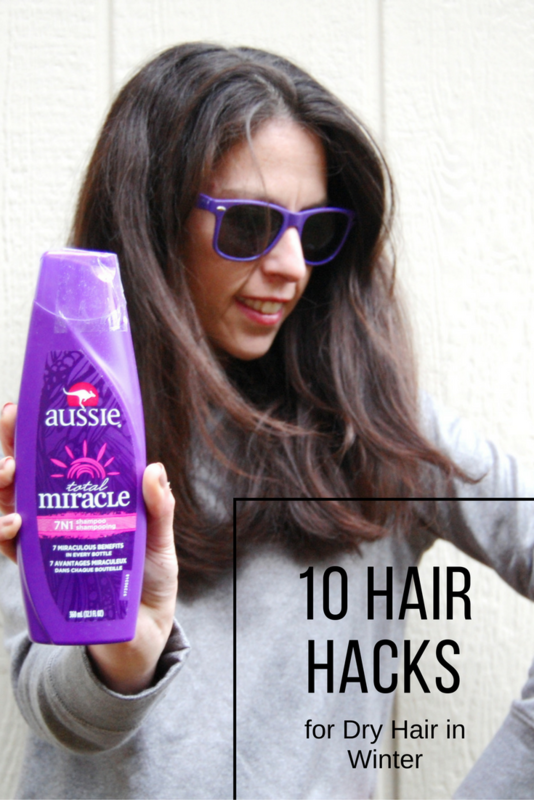 Today I'm partnering with Aussie to share 10 hair hacks for dry hair in Winter. If you're like me and as soon as the temps start dropping your hair becomes unmanageable, unruly and extremely dry, these 10 tips will help you survive the season! Aussie is all about aussome hair made easy and is the go to brand for women who want great looking hair, without all of the fuss. Making Aussie products a great place to turn for fabulous hair products in Winter and all year round. I've been a fan of Aussie since my childhood, when I remember that perfectly purple bottle (my favorite color at the time and to this day) perched on our claw-foot bathtub in our cabin on Whidbey Island. 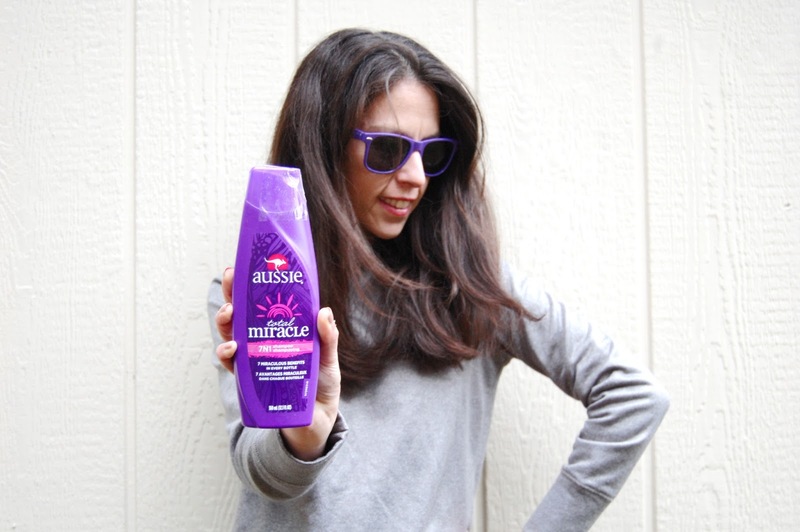 Aussie introduced the 3 Minute Miracle in 1979, and a cult following quickly took hold as women recognized the true moisturizing benefit of the Aussie deep-conditioning treatment in repairing the driest and most damaged of hair. 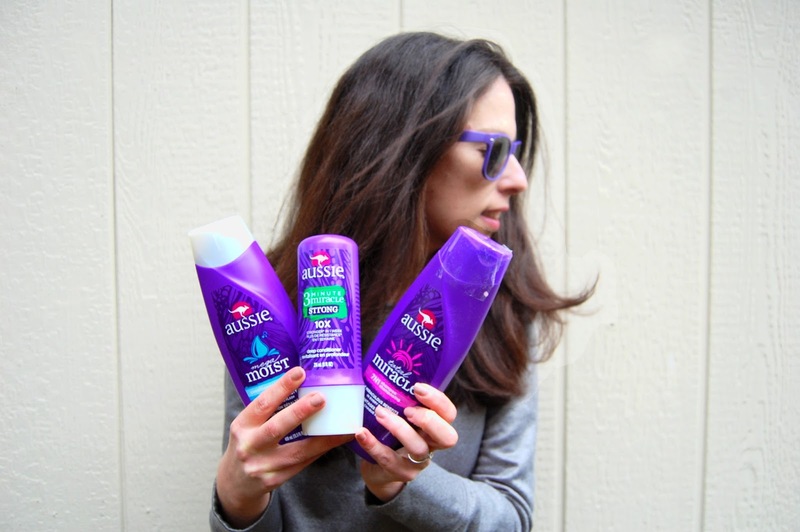 Now with an extended line of products, purple bottles still line my bathtub today and Aussie is my go-to in repairing my dry and damaged hair. I like to deep condition my hair one to three times a month (and as often as weekly) with Aussie 3 Minute Miracle Strong Conditioning Treatment during Winter. Since it only takes 3 minutes, I just add it to my normal routine during the week, in replace of my regular conditioner, to help reduce damage, lengthen the life of my locks, and shield from future damage. Made with Australian Aloe, Jojoba Oil and Sea Kelp, it smells amazing too! I find a deep conditioner will often make all the difference with Winter hair damage and it's definitely the one thing I refuse to skip in my routine during this season. I'm going to admit something here that you might find hard to believe, but I only wash my hair one to two times a week (and often only once per week!). During Winter when it's snowing or raining there is no going out with wet hair and air drying, and with my long, thick hair, washing and drying is no quick feat and not something I can always work into my daily schedule. And by washing less I reduce the amount of heat damage done by my dryer, flat iron and curling iron. I also find that even just by washing less my hair is happier and less dry. When I do choose to wash, I will turn to Aussie Moist Shampoo to quench my thirsty locks and nourish my hair for a luxurious silky mane. Maximum hydration is essential during the Winter months for my hair, as it seems to lose all moisture when the temps drop. Even with adding a deep conditioner into my hair routine, a moisturizing conditioner following shampoo is a must during the colder months. 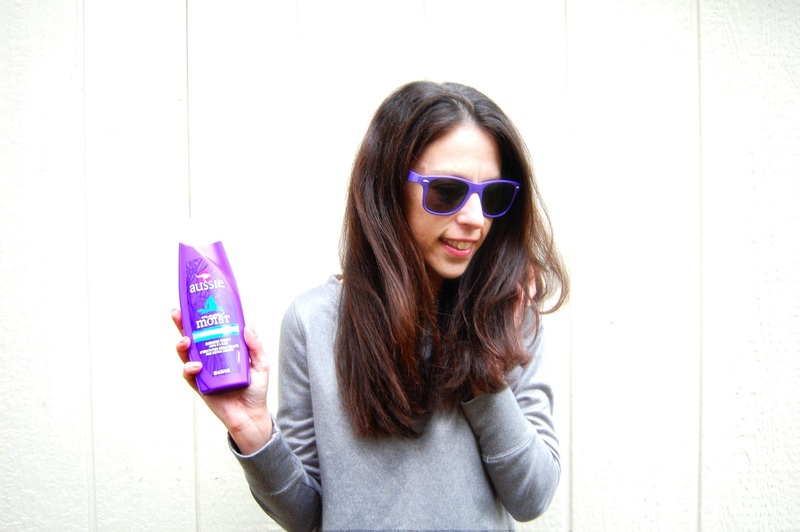 Aussie Moist Conditioner is my current favorite option for maximum hydration and will always leave my hair soft and silky. Sometimes I'll even skip the shampoo and use this conditioner alone. 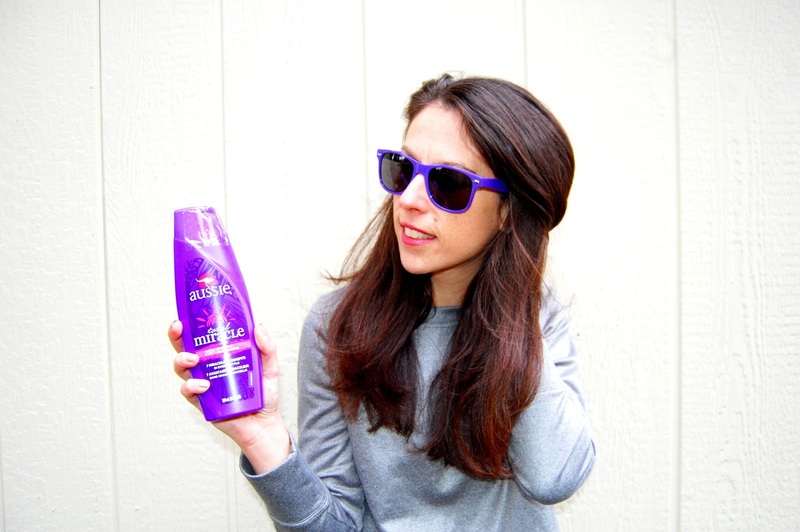 Besides hydration, protecting and strengthening my hair in the Winter months helps keep my hair happy and healthy. When my hair is feeling extra damaged and needs to be protected and strengthened, the Aussie Total Miracle Collection does serious wonders, with 7 miraculous benefits - strength against any damage, silky softness, split end protection, nourishing moisture, humidity control, brilliant shine and lasting smoothness. I like to start with the Aussie Total Miracle Collection 7N1 Shampoo and follow up with the Aussie Total Miracle Collection 7N1 Conditioner for frizz control and silky smooth and strong hair. And some days no matter what I do, my hair will just not do what I want it to. When it's looking a little bit too frizzy, disheveled and/or unruly I turn to the ever-so-popular and ever-so-classic top knot to get me through the day. The best of top knots look a little messy and not quite perfect, making this hairstyle ideal for Winter months. There are lots of variations on the top knot from the classic on top of the head to a french braided top knot and Aussie Instant Freeze Sculpting Hair Gel is perfect for holding top knots of all styles. Ideal for frizzy hair that refuses to hold, this gel will get you through both the best and worst of times giving definition and all-day hold to your style. I'm also a fan of a great hat to both keep me warm and cover up my hair if it's not looking how I intend. From the classic pom-pom Winter hat to a more floppy 70s style, the hat works as a great hair hack year round, but particularly during those cold months when you see just about everyone donning them! Perfect for adding a pop of color to an outfit, I'm a huge fan of this one and this one, and I'm always in search of the perfect silk-lined hat. And when it gets really, really cold, a hat is pretty much inevitable. I like to let the hat work for me by creating heat-free waves and curls. I'll braid my hair and pin it up under the hat. When I take my hat off, I undo the braid, letting out loose, beautiful waves without the time, effort and damage of a curling iron. The rise of the blow dry bar is what I call just short of a miracle. The perfect way to #treatyoself, I like to visit a blow dry bar one to two times a month in Winter (and really year round). Taking less than half the time I do at home to wash and dry, I can always feel less damage being done by heat when I get a blowout. Also the idea of a blowout lasting a week with no wash/dry/style required in between is ideal for when time is so precious during the holidays. Schedule one for right before a big event, sleep with it up in a top knot at night on a silk pillowcase and just let it down in the morning (running fingers through) for beautiful, easy hair. Dry shampoo will always help elongate my blowout and style, making it easier to wash my hair less often during Winter months. I tend to need it 4-5 days after washing, but if you have finer hair or if your hair tends towards greasy, this might be something you consider on the daily. Seriously, dry shampoo is everything. Hot water not only dries out the skin, but hair as well. I like to shower in lukewarm water (versus), which helps combat frizz and and dryness in my hair. Sometimes, however, when it is just really really cold, there is no way I am not taking a hot shower. In which case, I'll turn the water to cold just before I get out, as cold water seals hair follicles for shiny and frizz free hair. I didn't know they had another "miracle" product! I am obsessed with the three minute miracle. That stuff is actually magic, I chemically straightened my hair using a boxed product from the drug store once (I don't want to talk about it, they were dark times), and the 3 Minute Miracle was the only thing that could bring my hair back from that fiasco! 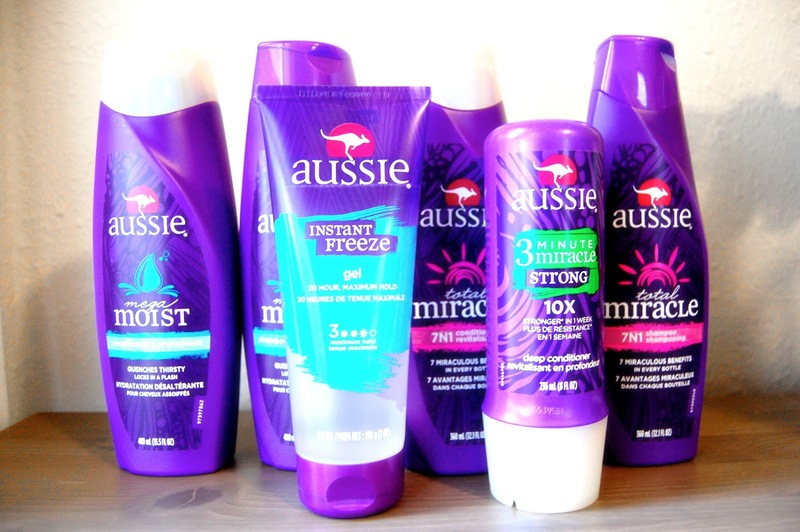 i just love aussie hair products! very reasonable and effective. i have pretty dry hair naturally i've tried many different products before but i must say it these work wonders for me!